Earlier this month I have mentioned an interesting device that I came across called Glascope and since after that I’ve had the chance to play with the device a bit here is my review of the product. 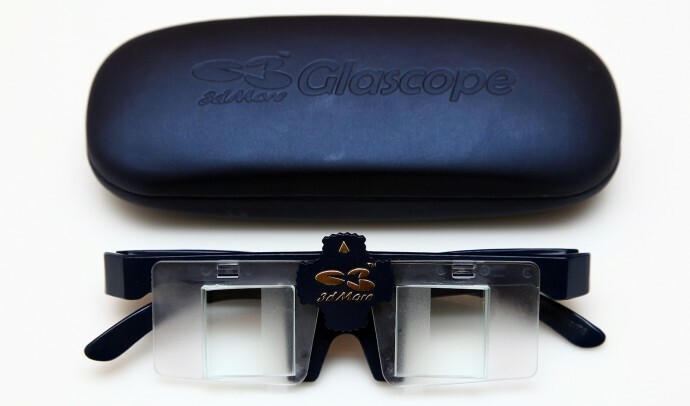 The Glascope being offered by Strange Dimension is essentially a stereoscope in the form of glasses that you put on your head and with it you can easily watch Side by Side 3D videos played on a 2D display in stereo 3D. This means you might be able to easily enjoy stereo 3D content in the form of photos, videos or even play games on a portable device like a smartphone, on a laptop, computer monitor or even a TV. There are however some limitations and drawbacks associated with the way that the Glascope works and I’ll get to these in a moment, so don’t get any ideas that this is some kind of a magical product that will turn any 2D display in a 3D one, because it is not (a magical product I mean). The Glascope is essentially a stereoscope in the form of glasses, the device consists of a frame with two plastic plates on which a smaller glass prism is attached and there is a knob at the center of the frame that can be rotated in order to bring the two prisms closer together or further away. This adjustment is used to have the prisms properly located based on the distance of the eyes of the user in order to ensure the best experience… the adjustment is suitable for people with distance between the eyes of about 6 to 7 centimeters which should be good enough for most adults, but might not be suitable for kids. The Glascope “glasses” come in quite simple design and feel a bit flimsy when you look at them, but after using them for a while I can say that they are actually quite durable. Looking closer at the two prisms of the glasses you can notice that there is a part of them that is matte and the rest is transparent, the idea behind that is that the smaller non-transparent area is used to block some part of the image displayed on the screen. So when you show a Side by Side 3D photo for example and you put on the glasses you move further from the display and maybe adjust a bit the knob at the front in order to have each of the eyes see only the left and the right part of the image shown on the screen. This way the brain actually receives two slightly different images through each eye and fuses them into a singe image with the perception of volume… just as if you are watching it on a 3D display. The drawback here is that this method essentially halves your effective screen size horizontally, so you get the feeling of watching a smaller size screen. The prisms do not have any correction for half horizontal resolution Side by Side 3D images, so you either have to watch the 3D with the wrong aspect ratio in order to have your screen fully utilized or to switch to the correct aspect ratio in the video or photo player and loose some of the effective resolution of the 2D display, but get the correct aspect ratio. And while getting the correct aspect ratio is an option if you use a PC for the playback of 3D content it may not be possible on most other devices, so you should be prepared for that. The Glascope glasses seem to be optimized for use with a smaller size 2D displays, or even prints in Side by Side 3D format, with more like 4:3 aspect ratio than the most common nowadays 16:9 in both computer monitors and TV sets. So when looking through the “glasses” you see a lot of the surrounding area around the monitor and this creates the feeling of the actual stereo 3D image you see seem smaller. There is an easy workaround to help you a bit with that, you just need to put some (preferably black) tape to cover some part of the prism for each eye – try to have them evenly sticked. On the photo above I’ve placed the black tape only on the bottom side to cover about half of the prism making it more suitable for widescreen displays with less distracting things visible besides the image on the screen. But playing with the tape I have quickly discovered that it is even better if you cover a bit from the top and a bit from the bottom of the prism with two tapes while still leaving about half of the area of the prism transparent. This helps in getting rid of of the slight barrel distortion that the prism may produce near its top and bottom parts and at the same time getting rid of other non-useful things from your vision through the Glascope besides the stereo 3D image you need to see. It also helps to get a better feeling if you use the device in a darkened room with no external lights besides the display you are watching on (less distraction in your vision). I’ve seen some slight chromatic aberrations visible in some 3D videos in the form of color fringes around the edges of highly contrasting objects as well, but this is something to be expected and in general the glass prisms used perform quite well. The image seen through them is clear and crisp,making it easier for the eyes if you plan to use the device for a longer period of time for watching some kind of 3D content on a 2D display. I’ve tested the Glascope with multiple 2D display sizes using different devices in order to give you a better idea on what you can expect from it and where and with what size of displays is is essentially useful for watching stereo 3D content. I’ll remind you that using this device essentially halves the size of the screen you are watching the 3D content on as you are only seeing half of the display with each of your eyes. For example using the iPhone 4 and playing back Side by Side 3D videos from YouTube on its 3.5-inch display I’ve had to hold the device around 16 centimeters away from the Glascope in order to get the best stereo 3D experience. The screen seemed a bit small and you can easily get an idea how big the screen will be if you hold a smartphone with a 3.5-inch display around 16 centimeters from your face and cover half of the screen, but the experience was quite good, besides the fact that you need to watch the 3D videos squashed. On a 12-inch laptop the distance I’ve had to watch the screen from was around 58 centimeters which is a bit further away than I usually use the laptop at and on a 27-inch monitor the distance I need to watch it from grew to 180 centimeters. For a 50-inch TV set I did not have enough distance to go away from the screen, but it should be at around 4 meters or essentially you need to be about twice the distance of the screen size in order to get the best experience when using the Glascope and the bigger the display size the harder it gets. The feeling you get when using the Glascope device is very similar to that of wearing a HMD device although the 3D screen size seems to be a bit bigger with the Glascope. 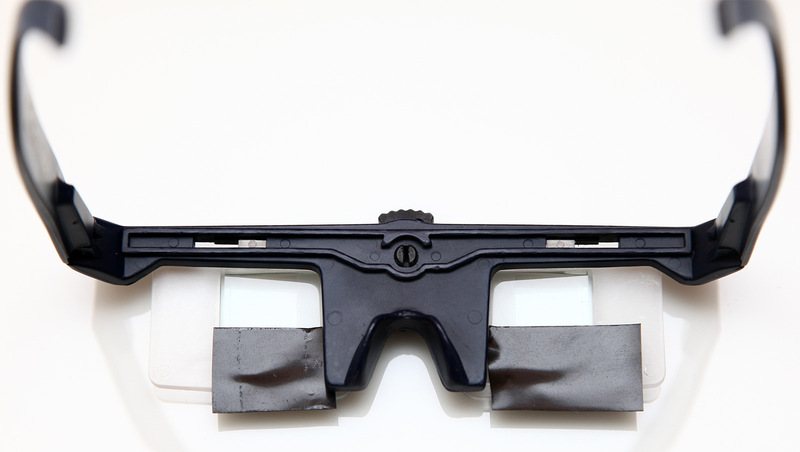 So the Glascope is indeed an interesting product to play and experiment with, it works quite well and provides a good stereo 3D experience, but there are also some limitations and things you need to consider if you plan on using it. 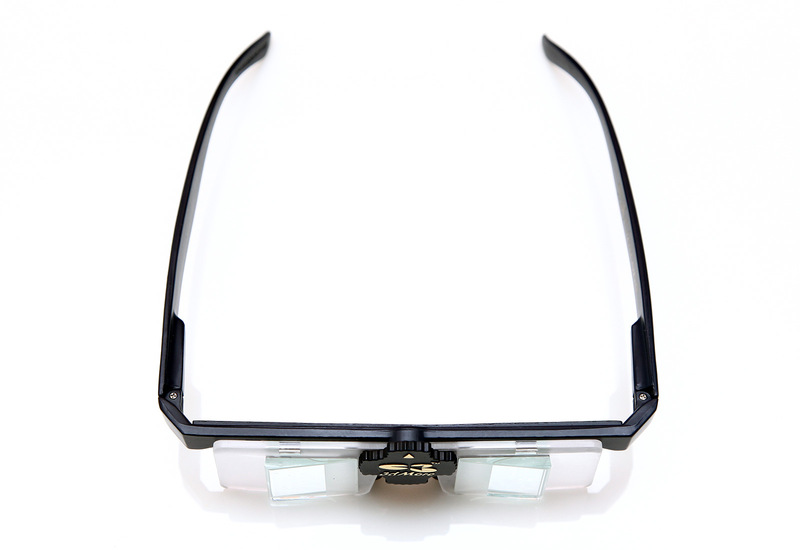 It works well with prescription glasses that depending on their size can be worn either in front or behind the Glascope, it weights about 42 grams, so it should not bother much anyone used to wearing glasses. The device works well with 3D photos and 3D videos and is not that comfortable for gaming in stereo 3D mode, although you can try by using software such as the iZ3D driver or the TriDef 3D Ignition for example. But as I’ve said don’t expect any miracles as this product will not be able to provide you with the same or even better 3D features and stereoscopic experience as a dedicated 3D monitor or a 3D HDTV set might. Thanks for this review. – I use these glasses to watch side-by-side 3d videos on my laptop. It works fine. To play the videos I use VLC, which allows me to switch to the correct aspect ratio. 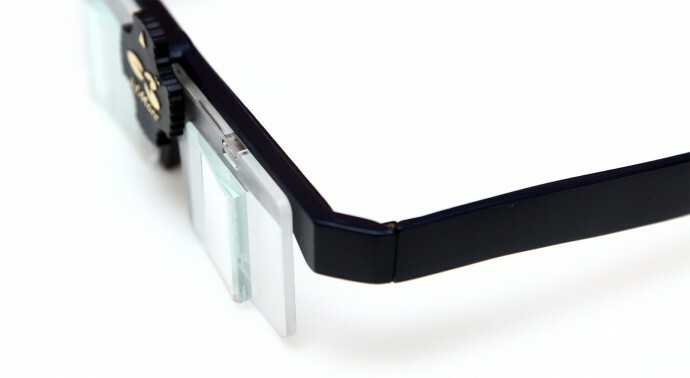 OMG, they made glasses to replace crosseyed viewing :D. Judging by the design of the lenses, that’s what these do. Anyway, if the price gets around 20$, I think this will be a great alternative to the anaglyph glasses as a cheap 3D solution, albeit the video size/AR problem. prism glasses wiht felxible prisms of NVP3D.com are much better. They also have the sonice mirror stereoscope. Yes, i also had to cover some parts. They made some minor mistakes in the last production. I added a rubber band to mount it on my head over my glasses. better is the sonice-like mirror stereoscope which has head-straps. sonice is the one without these straps. dont have the link present. berezin has these prism glasses-concept by nvp3d(switzerland). glascope is a “copy” of kmq-turned by 90 degr. and side by side versus above/below. Flexible NVP3D-prism-glasses can also be used to view screens of SDM-cameras, distance can/will be very close. btw: one cannot view such 3dvideo crosseyed, so these glasses are the simplest way of viewing. nvp3d-prism-glasses are flatter. have the same flexible prism like the glascope. Well, I was excited to get my Glascope glasses through the post today :( but the smile was soon wiped off my face. I went to you tube, and watched a side by side movie so I could experiment with adjusting them. Sadly no matter what I did – I still saw the split screen (TWO images), and it was not in 3D (I have a 2D 15″ laptop). I adjusted the slider on the glasses, but /never/ saw just ONE image (large or small).